Jaw surgery, or “orthognathic surgery” is necessary when the top and bottom jaws don’t meet correctly. Whether the improper bite has existed since birth, developed over time, or resulted from an injury, you’ve likely experienced difficulties with daily behaviors like chewing food, speaking, and even sleeping comfortably. Cameo Dental Specialists in River Forest, IL is proud to offer jaw surgery, or “orthognathic” surgery to help our patients with misaligned jaws achieve healthy, functional, beautiful smiles. Jaw surgery is a procedure that straightens or realigns your jaw and corrects related skeletal issues. While misaligned teeth can be straightened with braces and other orthodontic treatments, an improper bite often requires surgery to be fully rehabilitated. During the surgery, one our highly skilled oral and maxillofacial surgeons (OMS) will straighten and realign the jaw using surgical plates, or templates, screws, and wires. Patients are given general anesthesia to ensure their comfort during the procedure. After surgery, but before removing braces, we may make small corrections needed to finish your bite. Our team of dental professionals at Cameo Dental Specialists is dedicated to providing you with the utmost care during your jaw surgery and recovery. Is Jaw Surgery right for you? People who are best suited to orthognathic surgery are those with an improper bite or jaws that are not positioned correctly such as a severe over or underbite. Jaw growth happens gradually throughout a person’s life, and for some people, their upper and lower jaws may grow at different speeds. With an improperly aligned bite, many problems can occur that affect chewing function, speech, or long-term oral health and even your appearance. Trauma and injuries to the jaw also affect alignment. Congenital disabilities can also contribute to problems with jaw alignment. We at Cameo Dental Specialists use modern computer-aided techniques and three-dimensional models to show you just how your surgery will be devised. 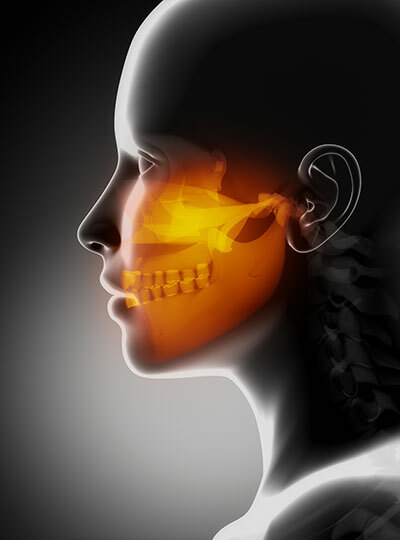 We’ll also use comprehensive facial x-rays to show you how exactly your bite will be improved. This helps you understand the surgical process and the extent of the proposed treatment. Before treating an improper bite, we’ll need to see you for a consultation to evaluate if jaw surgery is the best solution for you. During the consultation, you’ll meet with a specialist at Cameo and have X-rays taken. We’ll be sure to answer your questions about the jaw surgery procedure and outline what you can expect as we work to realign and perfect your smile.